The University of Kent’s Business School was delighted to welcome the Prime Minister’s Advisor on Enterprise, the Rt Hon the Lord Young of Graffham, to launch Enterprise Day on Wednesday 12 February 2014. Welcomed by the University of Kent’s Pro-Vice Chancellor Research Professor John Baldock and the Director of the Kent Business School, Professor Martin Meyer, Lord Young praised the University’s strategy of promoting student enterprise and delivered a speech outlining government support and encouragement for young entrepreneurs in a speech titled ‘Make Business Your Business’. Over one hundred current students and graduates as well as members of the regional business community attended the annual event at the Canterbury campus to listen to Lord Young and, to award-winning young entrepreneur guest speakers, Owen Hunnam, Founder of Yellowball, and Charmaine Kemp, Managing Director of Wheelie Good Mobility, who shared their very personal experiences of setting up a business. Enterprise Day was also an opportunity for the Kent Business School to launch an innovative student enterprise initiative – the 50th Anniversary Pitch It challenge aimed at engaging students with the University of Kent’s 50th anniversary celebrations in 2015. 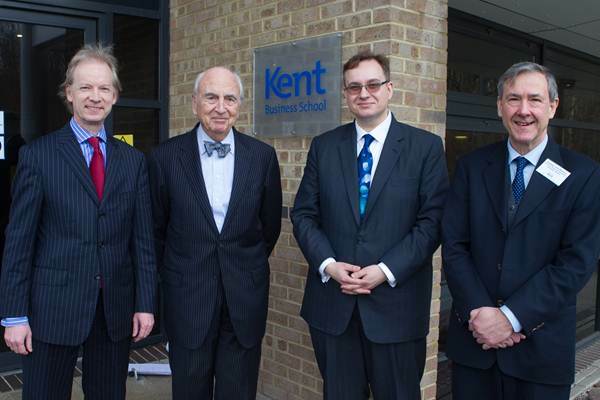 Photo (from left to right): David Williamson, Kent Business School Director of External Services; Lord Young of Graffham, the Prime Minister’s Advisor on Enterprise; Professor Martin Meyer, Director of the Kent Business School; Professor John Baldock, University of Kent Pro-Vice Chancellor (Research).